The Art of Skin-Mapping: A Method of Determining your Internal Health from the Condition of Your Skin! Skin-Mapping is an example of how ancient wisdom still reigns, but also how enlightened we’ve become in our quest for complexion perfection aligned with good health. It always amazes me how our internal health is reflected on the outside if we would only heed the messages. Indeed, there’s been a new surge of studies in an old therapeutic and pseudo-medical practice: Skin-Mapping. A technique that takes the condition of the skin in areas of the body and uses them to read internal health. 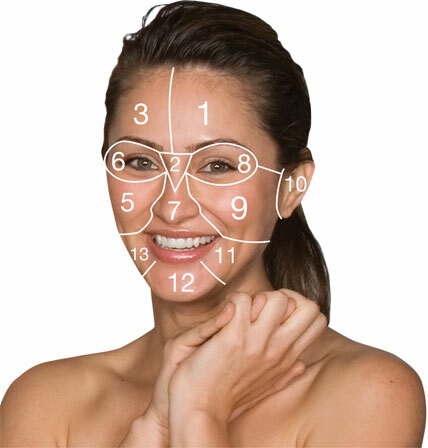 Indeed, Dermalogica has made it part of their norm, the above picture shows the company’s mapping zones. The art of skin mapping is based on Traditional Chinese Medicine (TCM) and centuries-old Ayurvedic wisdom. It can determine the internal workings of your body by bringing notice to certain flare-ups or unusual blemishes on the skin. Let’s focus on seven regions and zones looked at in a skin-map reading. In my experience, these areas have the most tell-tale signs. Pay careful attention and see if the main skin-mapping zones mentioned here hold relevance for you. Not only are your eyes the windows to your soul they’re also the window to your health. Eyes can be indicative of the condition of your joints, intestines, thyroid gland and kidneys. Clouded and puffy eyes can indicate poor nutrient absorption in your colon or small intestine. Yellowing signals a weak or fatigued liver; and, swollen eye bags can show lowered kidney function. The nose has a very special job. It delivers messages of positive and negative internal functions with your bloodstream and heart. Biologically speaking, when zits, blemishes, and pimples arise on the nose, the internal system has flared up in heat. This is due to the connected nature of your nasal passage and your circulatory system. Red colouration or excessive heat in the nasal area can be tied to issues in blood circulation. The colouring of your nose can change when blood is not adequately progressing to the heart or throughout the body. Many skin-mappers always use the nose as a pinnacle starting point when assessing health. The sensors on the tongue can be indicators of clotting, internal toxin buildup, and lung issues. This is due to an accumulation of phlegm and other unwanted substances the body tries to dispel orally. The residue of these bodily fluids can cause a change in breath, orchestrated mainly by your tongue. Another clear indication can be found in the form of a coating on the tongue, which can point to a buildup of toxins in the liver, lungs, and intestinal passageways. This could mean a detox is needed in order to rid the internal canal of harmful pathogens. A drink of cranberry juice or lime water daily for a week will get you on the road back to feeling fresh and new. In skin-mapping, the area between your forehead is a clear gauge for problems surrounding the liver. The liver’s job is to remove as waste toxins that are not needed after food and drink consumption. When this process is impeded, the space between your eyebrows becomes reddened and itchy. Thus, the eyebrow area may begin to break out while the rest of the face stays clear. This may also bring about unwanted headaches, and in worse cases, head-pounding migraines. This area shows the internal state of your lungs and kidneys. More focused on the lungs, outward pollutants—such as cigarette smoking, smog, and asthma—can cause damage to this area. Stress is another factor that can be damaging. If you notice damage or sensitivity on the cheek area up your quota of green, leafy vegetables. They help to protect and promote healthy functioning of your lungs and your liver. The chin in skin-mapping stands as a representation for the stomach and hormones. Eating too much of the wrong things can cause this area to break out, so limit yourself. If you have flare-ups on your chin area like blemishes, pimples, and cysts, this can be an indication of stomach pH and/or hormonal issues and a signal to clean up your diet. The lips can give away the current internal state of your intestines, while also mapping your hydration levels. If your lips are chapped and stay chapped no matter how much moisture you apply to them, you may not be drinking enough water for your body type. Pale lips can indicate anemia and other blood-thinning conditions. Purple and blueish colours are a sure indicator of failing or corrupted internal oxygen levels. All of the zones above can be indicators of our personal health. It’s what skin-mapping is all about – it’s the skin speaking (sometimes screaming) to us about our internal health. Check yourself in the mirror to see what changes you can see – do they match up with how your body is telling you it feels? If you can’t assess for yourself, you can always make a time to come and see me. I’d love to help out. Email me at hello@youology.co.nz.